The 13th Amendment in its various manifestations is in for consideration. It is best if the following issues are discussed in this forum and elsewhere by patriots so that their implications for the future of Sri Lanka and for the future generations of all Sri Lankans are given due consideration. Let the politicos who are only worried about their length of stay in power and their families too understand the implications. Most of all let the people know! Sri Lanka is a country the size of Tasmania and a population the size of Australia! The major concern for all who inhabit Sri Lanka is living space. The ever-increasing population of Sri Lanka needs space to live. This has to be found within the boundaries created by the natural shoreline. The future living space for Sri Lankans lies in the North and East of Sri Lanka “”…” most of it now claimed by Eelamists! The Tamil population in the Eastern Province and mostly in the rest of the Northern Province other than the Jaffna Peninsula has always been mainly a coastal population “”…” most of them descendants of Indian labor brought in to tend tobacco plantations and other squatters “”…” remnants of temporary dwellers “”…” fishermen, pearl divers, tree tappers etc. Majority of them brought into to tend tobacco plantations and since their settlement initially by the Dutch and then by the English have lived within a few kilometers from the seaboard. This high concentration along the seacoast is now averaged over entire districts to show their claim to the province! Their bogus history says they have inhabited Sri Lanka for thousands of years, but they have nothing of historical or of archeological value to show that they have lived, worked and prospered in this Sri Lanka except as itinerant travellers, adventurers and squatters. Yet they want to call the land their historical homelands now. 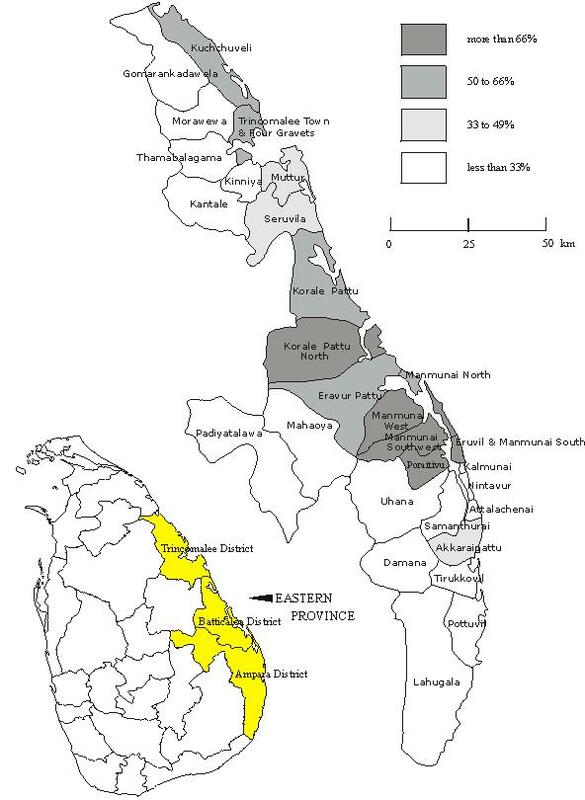 In the absence of a true history, Tamils were forced to call these areas Traditional Homelands only a few years ago! The above graph shows how the “Sri Lankan Tamil” Population in Sri Lanka increase with the Indian Tamils leaving Sri Lanka under Sirima “”…” Sastri Act in 1972 . Most of those leaving Sri Lanka were clandestinely absorbed into the Northern Tamil population. 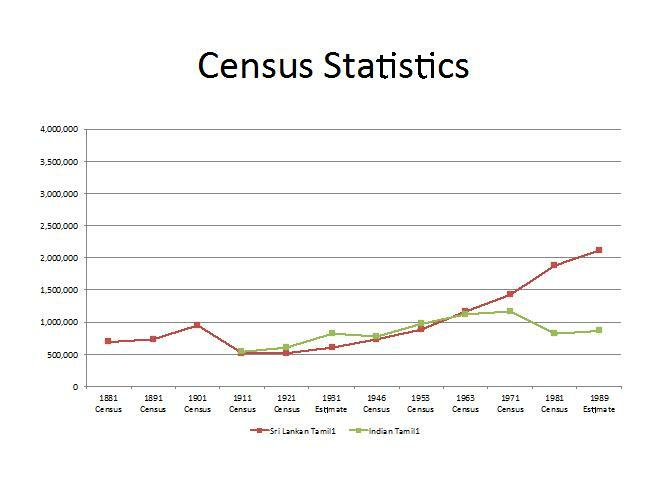 The dip in the Indian Tamil population between 1971 and 1981 and the upsurge in the Sri Lankan Tamil population during the same period in the graph shown above is a testimony to this fact. Once land powers are given there will be further influx of illegal immigrants from Tamil Nadu to boost up their numbers! Can the Sri Lankans allow a mere 5% of the population comprising racist Tamils to possess and dominate this land “”…” 1/3 of the land mass and 2/3 of the seaboard together with the 12 mile territorial limits and the 200 mile economic zones. Please note there are moves to extend the 200 mile economic zones even further. The North and East of Sri Lanka is historic Sinhala land as history and archaeology proves. Will the land freed by our valiant soldiers be bartered away for political expediency? They are already coming in their dark stinky swarms!!! PRUNING PC POWERS is NOT ENOUGH! Separatist ENTITIES have an INHERENT Historical Tendency to ACCRUE Power, by Bribery, Blackmail, Deceit and Treason. GET RID OF the 13th Amendment by Leaf, Branch, Trunk and Root! We don’t want to fight this battle FOREVER! DON’T PLACATE Sri Lanka’s internal and external enemies by RE-INTRODUCING the 13-A in ANOTHER DISGUISE to DEVOLVE POWER to SEPARATION-PRONE Minorities in lightly populated, large PROVINCES of the country. DON’T SETUP ADDITIONAL Layers of Governance that will UNDERMINE Central Government’s DUTY TO PROTECT the Integrity, Security and Sovereignty of the Nation. AVOID the URGE to IMPOSE unnecessary, unwieldy, costly, centers of separation staffed by useless highly-paid bureaucratic bunglers upon the heads of long-suffering Sri Lankan taxpayers! ENOUGH Bureaucracy ALREADY! DO PERMANENTLY station the Sri Lanka Defence Forces in the North & East, and ALL around the country, to DEFEND & PROTECT and DEVELOP National Infrastructure. Remember, Allied Forces STILL OCCUPY EUROPE in the GUISE of the NATO, not only to DETER external enemies in Eastern Europe, but also to PREVENT Fascists from RAISING their UGLY HEADS again in Western Europe! What is GOOD for the Allied GOOSE, should be GREAT for the Sri Lankan gander, as well ! Congenital IDIOCY as GOSL Policy MUST STOP someday, somewhere. GET RID OF the 13-A without REINTRODUCING IT in a ANOTHER GUISE; DO IT NOW, than RUE the FAILURE LATER! The Sri Lankan Government would ask the Parliamentary Select Committee (PSC), which is to be set up to draft a new devolution package, to ‘drastically’ prune the powers of the Provincial Councils (PCs), a source close to the regime told Express here on Sunday. The government would not go to the extent of abolishing the PCs, which were set up at New Delhi’s instance following the India-Sri Lanka Accord of July 1987, but it was bent on pruning the powers of the PCs drastically to rid them of features which abridged the powers of the national parliament and the directly elected Executive President, the source said. The 13th Amendment and the Provincial Councils (PC) Act of 1987 had placed several constraints on parliament’s ability to make laws on subjects devolved to the provinces. They also curbed the powers of the provincial Governor who was supposedly an agent of the Centre. The Sri Lankan Centre was not given the powers that the Indian Centre had vis-a-vis the States to curb separatism and misrule. The Sri Lankan Centre’s hands were tied by prohibitions and the cumbersome procedure of passing laws with a two-thirds majority and, in some cases, through a referendum. The source said the government was afraid that a Tamil-dominated Northern Province ruled by the “separatist” Tamil National Alliance (TNA) might spin out of control and make unacceptable demands on the Centre. The fear that India and Tamil Nadu might collude with TNA to destabilise Sri Lanka again (as they did in the 1980s) was very much there, he added. The source said that the Rajapaksa government was keen on having the Provincial Councils Act amended before the Northern Provincial elections scheduled for late 2013. To enable this, the PSC would be constituted soon, whether or not the Tamil National Alliance joined it, the source added. The Mahinda Rajapaksa government has a two-thirds majority in parliament needed to amend the constitution. And, as Basil Rajapaksa, the powerful Economic Development Minister in Lanka, has said the government is ready for a referendum too. 13 amendment MUST BE SCRAPPED. Then the right thing to do is to SCRAP 13 amendment. IF 13 amendment remains, TNA will anyway WIN the Northern Province!!! ALL patriots must demand the total SCRAP of 13 amendment. NO BULL. What is this. The most of Sri Lanka is against it and the govt by its inaction and India wishes to shove it down our throat. This is the price you pay when you appoint clowns to parliament. The agitation you see in Lanka web is not seen in the parliament. They rarely mention it. The 13th amendment will never be changed , What is the govt going to do with the other idiotic politicians in the provincial council. Politicians look after each other. There is so much of corruption alleged in the papers daily . Does Ranil W or the UNP open their mouth as to how they are going to tackle it. No, there will have to be a revolution before the country has a government that will function for the benefit of the people. What the Indian Express has mentioned is what we knew all along. 13A will not be removed. Government plans to tweak it and keep it. Expenses are going to double as provincial recurrent expenses will remain and new expenditure for powers and activities taken from the provinces will be added. We are going to have very expensive concurrent devolution and decentralisation units. It will be an additional burden on the people. This massive plunder coupled with inefficiencies and lack of good governance (resulting from multiple layers of governance) will bring the UPFA closer to a gigantic defeat similar to 1977. Following it, the ruling clan will face war crimes charges. This is where the country is heading. The island will remain divided along ethnic divisions as now. It will be Tamil Elam in waiting. With wide spread use of Tamil, the island will be a natural extention of Tamil Nadu. Not just the 13A, the new proposal must also be put to a referendum for it to be a home grown solution. 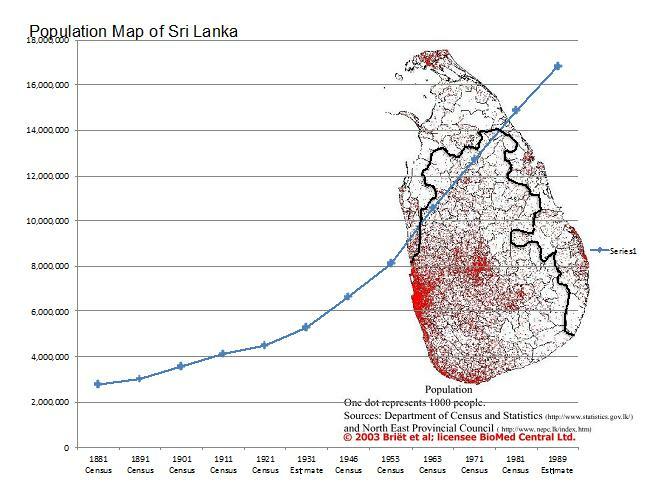 The last line graph by Sarath Bulathsinghala shows the rapid growth of Tamil population fuelled by illegal migration and the conversion of Indian immigrants in to Sri Lankan Tamils. On top of the above analysis, Sri Lanka is among to top twenty nations (not territories) in population density (320 persons per square kilometre). I am uder fire by the Moderator for metioning this. Whom should I blame ? Maharaja with 2/3 majority neglected most important work and betrayed the motherland. Is India, Tamil Nadu, and the International Community stopping the scrapping of the 13-A completely ? GoSL should do BOTH, have a REFERENDUM and also vote 13-A out with 2/3 majority vote in Parliament. That way the People of Lanka have spoken loud and clear. That is real Democracy at its best. Also, what does the Leader of Opposition have to say about scrapping the 13-A ? He said that changes, if any, should be practical and they should not seek to nullify the concept of devolution. While noting that the supremacy of parliament should prevail at all times, Attanayake said that devolution was necessary for the smooth functioning of areas which were far removed from the centre. However, he stressed that any discussions on the amendments to the Constitution should necessarily involve the future of the executive presidency, the electoral system and re-establishment of the Independent Public, Police, Elections, Judicial Service and Bribery and Commissions, which were abolished by the 18th Amendment. Attanayake said that the UNP leader Ranil Wickremesinghe, he said, had explained his party’s position on constitutional reforms when National Freedom Front leader and Housing Minister Wimal Weerawansa met him at the Opposition leader’s Office in Parliament, last week. The talks had been held at Weerawansa’s request and the UNP had, at no stage, agreed to the abolition of the 13th Amendment if the executive presidency was scrapped, he noted. 13th Amendment must be abolished just because it was imposed on the people of Sri Lanka under duress, by an enemy entity – namely India. It has not been endorsed by the people of Sri Lanka. We are a proud nation and we cannot have this type of Indian crap included in our constitution. These reasons alone are good enough to relegate this used Indian toilet roll to the dust bin of history. LorenZions’s friend has opened mouth worrying 13A could be discarded.